Kangaroo care or kangaroo mother care (KMC) is the name given for carrying a newborn baby in continuous skin-to-skin contact, snuggled against a parent’s chest and ideally fed exclusively on breast milk. When carried in skin-to-skin contact with his mother, the newborn baby feels safe and calm and instinctively searches for the breast to latch and breastfeed. Not only is kangaroo care very helpful to breastfeeding success, it has many other advantages for the newborn by reducing stress and promoting healthy brain development—factors particularly important for the vulnerable premature baby. 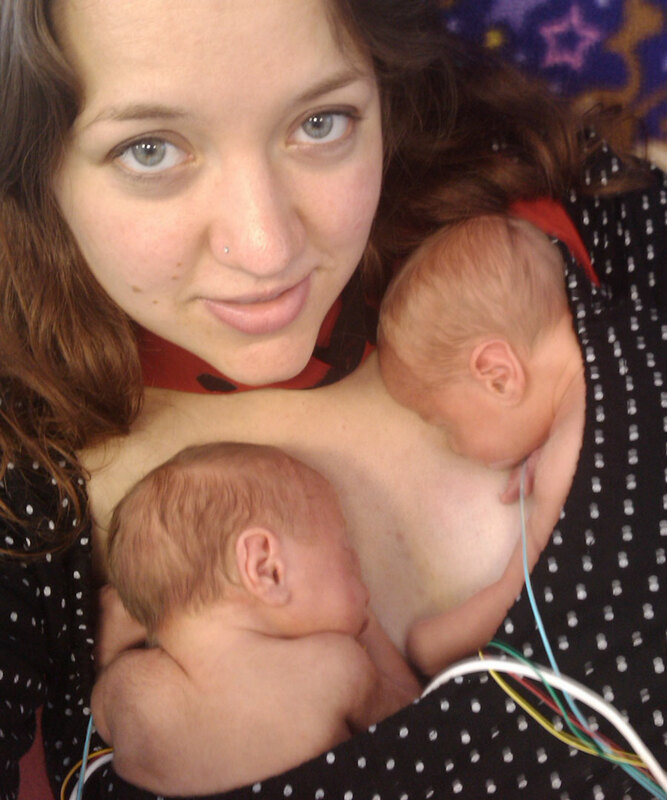 The World Health Organisation recommends kangaroo care for low-birth-weight babies1. 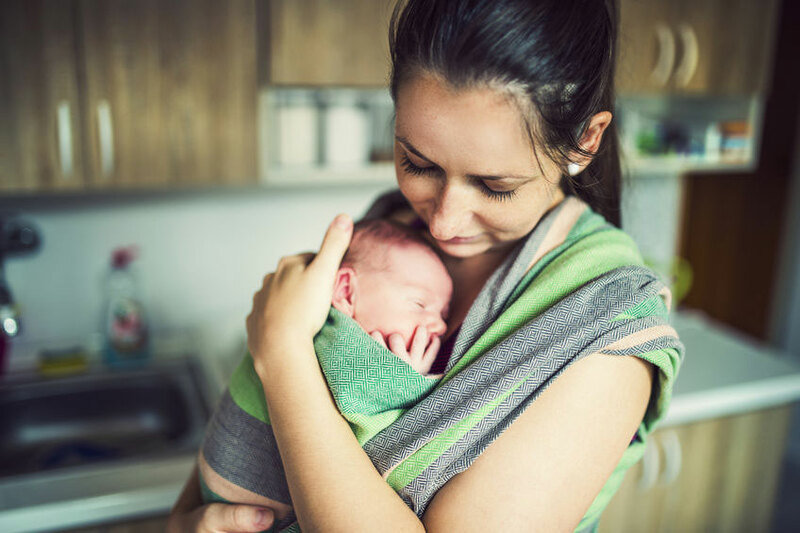 This article discusses why kangaroo care works, the advantages to mother and baby, and how to do it. It is a companion article to Breastfeeding a Premature Baby and Why Skin-to-Skin? When can kangaroo care start? The sooner a baby can have kangaroo care, once they have received any urgent medical interventions, the sooner it helps their little bodies adapt to life outside the womb. Kangaroo mother care can stabilise babies faster than an incubator and provides the stimulation to their senses needed for healthy brain development such as feeling safe and warm, smelling and looking at their mother, tasting breast milk, or hearing their mother’s heart beat. Premature babies can begin to breastfeed from 28 weeks gestation but kangaroo care can get started before this, even while your baby still needs oxygen or intravenous fluids, and will help to get breastfeeding established earlier (Bergman, 2010). See Breastfeeding a Premature Baby for more information about breastfeeding. In kangaroo care the feelings of safety and security provided by the mother’s body allow the baby’s body functions to regulate. In skin-to-skin care the baby’s heart rate, blood pressure and temperature stabilise, oxygen saturation is more stable, breathing is better with less episodes of apnoea, and baby experiences better quality sleep than in incubator care. And so a premature baby is less stressed and better able to digest food to grow 4 5 6. A mother’s chest regulates a baby’s body temperature more consistently than an incubator. Breasts can warm a baby if he is too cold and cool him down if he is too warm7. During kangaroo care, a premature baby’s overall growth rate increases. This is in part due to the baby’s ability to sleep, thus conserving energy and putting caloric expenditure toward growth. According to Dr. Ludington, during the last six weeks of pregnancy, babies sleep twenty to twenty-two hours per day. In a typical NICU, however, they spend less than two hours total in deep, quiet sleep. Most of that comes in ten or twenty second snatches. With kangaroo care, the infant typically snuggles into the breast and is deeply asleep within just a few minutes. These babies gain weight faster than their non-kangarooed counterparts, and it is interesting to note that they usually do not lose any of their birthweight. Crying is extremely stressful for a premature baby and uses up precious calories. Crying increases a baby’s heart rate and blood pressure, this can open a valve between the two sections of the baby’s heart, so that deoxygenated blood can be sent to the brain instead of the lungs. By raising the blood pressure, crying can also cause a brain bleed, a common problem in premature babies. By caring for a baby in kangaroo care, there is less crying, and the baby is better able to cope with any stress that he does encounter 8. The increased bonding in kangaroo care helps long term emotional health 9. In kangaroo care the premature baby has less of the stress hormones somatostatin and cortisol. Presence of somatostatin slows down the gut and so the baby’s growth rate. Cortisol increases blood pressure which can contribute to the brain bleeds common in premature babies (Bergman, 2010). In addition, skin-to-skin contact may promote the release of digestive hormones 10. In skin-to-skin contact [SSC], the baby is in a relaxed mode so all her hormones prepare her gut to absorb food maximally. SSC babies can grow at 30g per day which is twice the rate of an incubator baby. Skin-to-skin care will mean less time in hospital. See Breastfeeding a Premature Baby for more references on weight gain. Brain growth is as important as physical growth for the premature baby. What a baby feels, senses and digests is vital to his healthy brain development. Being cared for in a brightly lit baby care unit and separated from his mother in an incubator is very different to being carried in a uterus with all his needs met naturally. Kangaroo care allows the developing baby to feel, touch, hear, smell his mother, taste her breast milk and feel safe. These are all sensations that “fire and wire” the brain correctly which ultimately determine a baby’s emotional development. The close presence and touch of parents are therefore vital for a premature baby’s brain to develop normally. Breast milk also contains 200 or more “non protein nitrogens” to correctly build the human brain and gut and provide immunity. Cows’ milk, in contrast has only 2% of these non protein nitrogens (Bergman, 2010). See Breastfeeding a Premature Baby and Human Milk Fortifiers for more information about nutrition for a premature baby. Carrying your baby in kangaroo care has many advantages to breastfeeding; breastfeeding usually starts more easily 11, more breast milk is produced, feeds are more frequent, there is better digestion and faster weight gain. Breastfeeding also supports a significant decrease in diseases such as pneumonia, septicaemia and necrotising enterocolitis 12 13. Kangaroo care can help parents bond and interact with their baby, feel empowered and more confident because they are able to help with their baby’s care. Skin-to-skin contact releases more oxytocin which helps with feeling calm and with mother’s milk supply. Mothers can feel less depressed, less stressed and better able to cope with having a premature baby when they care for their baby by this method 14 15. Kangaroo care can create substantial financial savings to families and health care facilities thanks to less reliance on technology, parents carrying out much of their baby’s care and shorter hospital stays 16. A baby wearing only a nappy and a little hat while held under mothers clothes next to her breasts allows full skin-to-skin contact for kangaroo care. The more skin-to-skin care your baby can have the better. Jill Bergman advocates firm holding or “containment” as feather-light touch or stroking can irritate a baby’s sensitive skin. The following video from Global Health Media explains the benefits of skin-to-skin for small babies and describes how to wrap a baby to the mother’s chest and position them safely. The video includes important warning signs to watch out for that might suggest your baby needs medical care. See the full article for more tips on successful kangaroo care including how long to hold your baby to get the most benefit, how to position your premature baby’s head so they can breathe easily during kangaroo care and how to navigate your baby’s sleep cycles. Nils Bergman advocates for as much skin-to-skin contact as possible—kangaroo care 24 hours a day is ideal to minimise stress for your baby—and this can be shared between a baby’s parents/care givers17. Kangaroo mother care is an important part of the care of a premature baby whatever the medical setting. Not only does it help stabilise a baby’s body systems and promote breastfeeding, it has important benefits for a baby’s brain development and emotional health.